Fco - Fiumicino Airport 19 Mi Northwest. Some Rooms Offer A Spectacular View Of The City. Larger Size Rooms Than Superior Doubles. Shuld Be Checked With Property Prior To Selling. 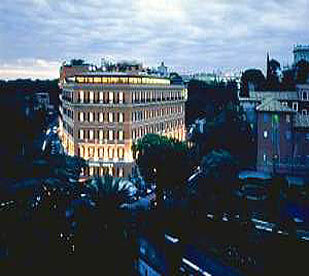 Suite Has 5 Balconies Overlooking Rome. Time zone GMT Plus 1 Hour. Check in time is 1400. Check out time is 1200. Guarantee Policy: All Reservations Must Be Guaranteed By Credit Card. The Following Are Accepted- Ax/ Ca/ Dc/ Jc/ Vi. Cancellation Policy: Cancellations Must Be Made 2 Days Prior To Arrival.